Got solar? Ready to consider an electric vehicle? Or … are you thinking about powering your fabulous EV with the sun? 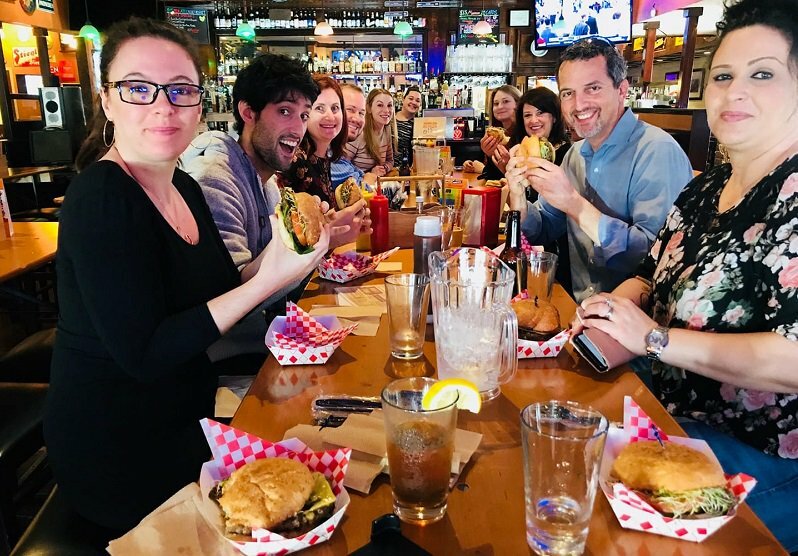 Join us for a spring afternoon visiting neighbors around Davis who have both! Get your questions answered and come away with your own plan for Driving on Sunshine! 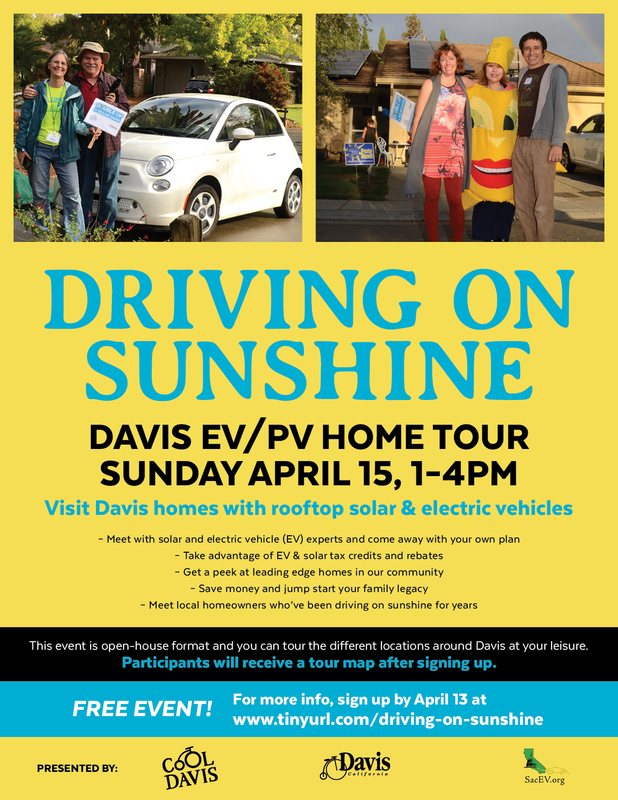 The Cool Davis Double Up on Solar campaign team is partnering with working group Davis Electric Vehicle Association (DEVA) to give residents a peek at leading edge homes in our community. Calculate last year’s taxes early so you have time for the future! Homeowners will be on hand to tell their stories and help you write your own chapter. Some have been driving on sunshine for years; others are just getting started. Now is your opportunity to make a plan and take advantage of solar and EV tax credits and rebates still in place. You could be driving on sunshine, too! Presented by Cool Davis and the City of Davis. Wondering if now is the right time to buy or lease an EV? 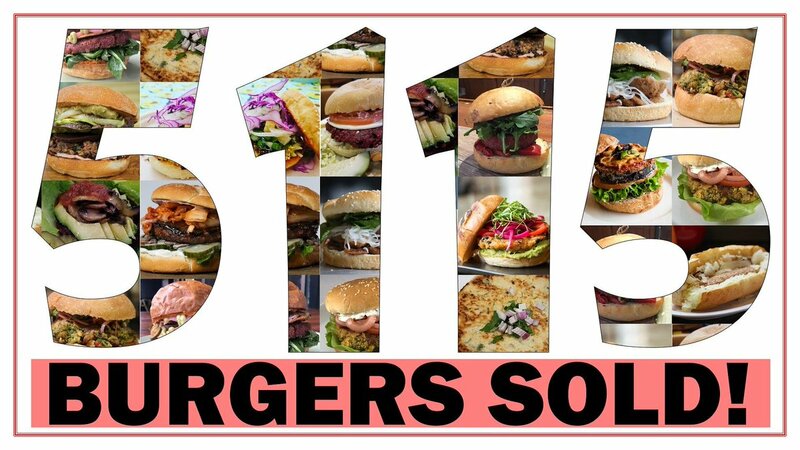 Read super volunteer Mike Kluk’s article about the EV Tipping Point in the Davis Enterprise. 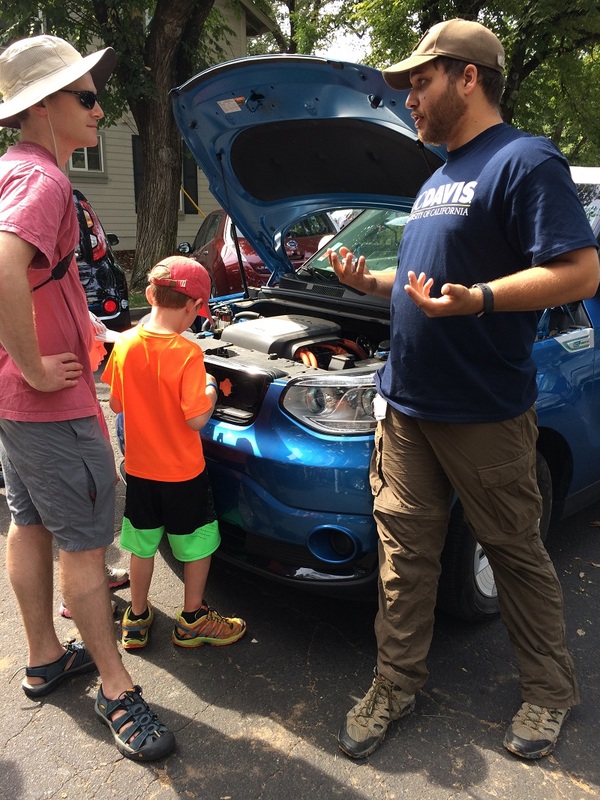 Kia SoulEV owner Alex Campbell, a master’s student at UC Davis in the Energy Graduate Group, chatted with families about electric vehicle (EV) ownership at the Cool Davis Farmer’s Market Ride & Drive event held September 16, 2017, adjacent to the Davis Farmer’s Market on 4th Street between C and D as part of National Drive Electric Week. Campbell just upgraded to a 2017 Bolt EV. Courtesy photo. 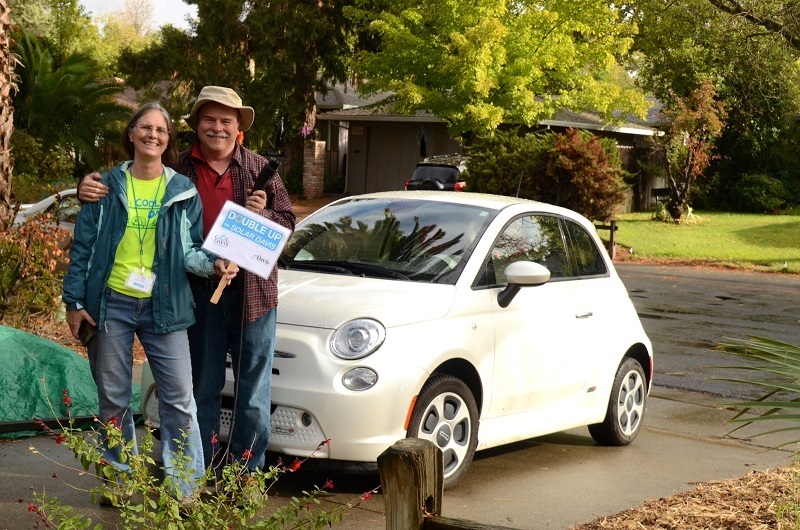 When the family minivan was towed away, John Johnston and Chris Granger leased a Fiat 500e as a commute vehicle for John’s daily trips to the CSUS campus where he teaches. Photo credit: Johan Verink. 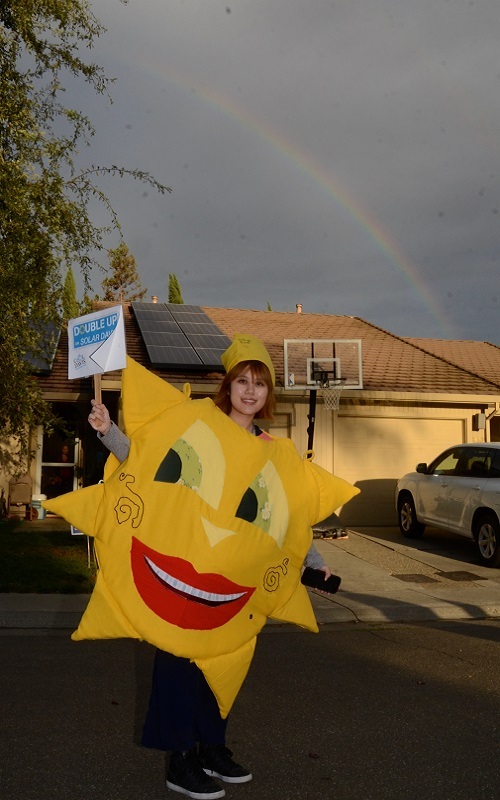 Mengmeng Fang dressed as Double Up on Solar mascot El Rayito encourages homeowners to put solar on the roof and an EV in the driveway. Photo credit: Johan Verink.